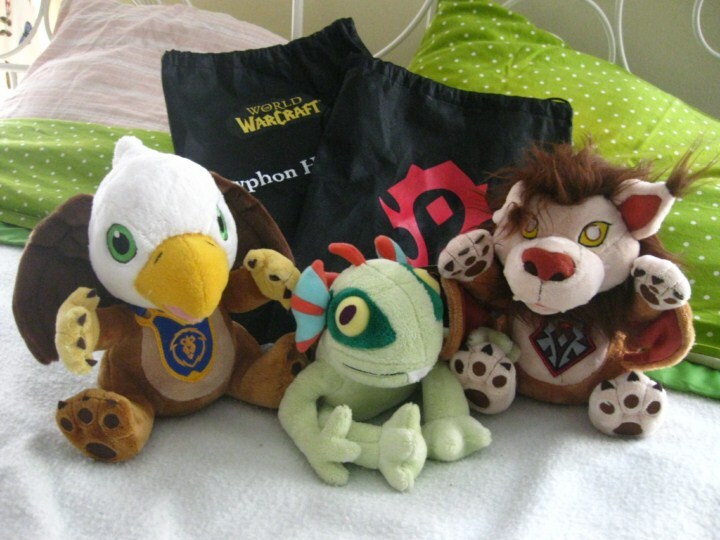 Blizzard Plushies: Are They Worth It? Everyone knows that I am a sucker for in-game pets. I’ve spent countless hours farming for some, grinding for others, avoiding ninjas for more and dumping assloads of money for still more. Achievements are Juggynaut’s thing, non-combat pets are mine. Basically, I’ll go to the ENDS OF THE EARTH for some cute, cuddly creature. Despite this infatuation with small animals – perhaps that is why I selected a gnome? – I didn’t break down and purchase either of the introductory pets. Lil’ KT and Pandaren Monk have everything I want – coolness (literally in Lil KT’s case), custom animation and interactivity – but they also possessed a hefty $10 price tag. I couldn’t convince myself to drop cold hard cash on them. It turns out all Blizzard had to do was add an in-real-life item to gawk at. Now the question to ask is, “Are they worth it?” Check the above video to find out. Last but not least, here is your gratuitous plushie-on-a-bed screenshot. Look who found a pair of new friends. Thanks for delivering these kinds of superb content.